Events take place every day which prove that America is a country in a serious and dangerous state of delusion. In the United States, trivialities are treated with great importance and vital issues are ignored or diminished if they threaten the rule of white supremacy. On July 19, 2015, Samuel DuBose was killed when a private security officer at the University of Cincinnati shot him in the head. As the Malcolm X Grass Roots Movement told the world in 2012, murders like this take place roughly every 28 hours. Not only do law enforcement officers have the right to kill black people at will, but so do private security. In some cases, a civilian vigilante like George Zimmerman is given tacit state permission to kill when in the service of the 21st century slave patrol. DuBose’s car was missing a license plate, which led to a police stop, which led to a physical confrontation, which led to him being shot. As in the case of Sandra Bland, a traffic citation turned deadly because the target was a black person. These killings are common and now show other familiar and very disturbing patterns. The killer has been charged with murder but is out on bond, having raised $100,000 in less than 24 hours. DuBose’s family traveled down the all too common but sickening road of first forgiving the killer and then added to their shame by hiring Mark O’Mara to represent them. O’Mara is the attorney who successfully defended George Zimmerman in the murder of Trayvon Martin. It was all painful to watch. Another police “snuff” video showing a black person’s murder followed by a grieving family who due to their own personal delusion and lack of political sensibility are unable to speak truthfully. If the usual script plays out, the security officer will be acquitted and the Obama Justice Department will refuse to exercise its prosecutorial power. The anger and the grief caused by the killings of people like Samuel DuBose are still felt most keenly within the black community. Within the white community killer police get sympathy and even raise large sums of money. Darren Wilson is now a much wealthier man for having killed Michael Brown in Ferguson, Missouri last year. While black people cry out in anguish over human murder, white people reserve their outrage for the deaths of animals. Recently a dentist from Minnesota traveled to Zimbabwe in search of a wild animal trophy. Dr. Walter Palmer killed a lion after luring him out of a wildlife sanctuary. Unfortunately for the hunter, the lion was a tourist attraction and had been anthropomorphized with the name of Cecil. Of course lions don’t have names but many white people have a unique ability to humanize every other living thing except a black person. 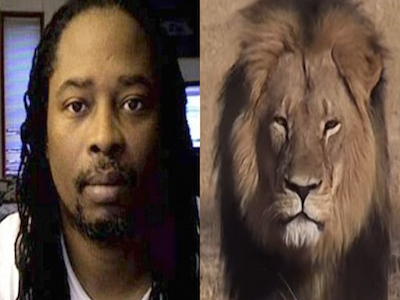 While DuBose’s murder elicited a shrug of the shoulder in many quarters, Cecil’s killing inspired international outrage fueled with the help of social media. Celebrities like late night talk show host Jimmy Kimmel were near tears on camera because of Cecil’s untimely demise. The killer dentist had to close his practice, hire a crisis management firm, and get out of town for a while. Eventually even his public relations person distanced himself. Ray Tensing, Samuel DuBose’s killer, has no such problem. He is walking around free because of moral and financial support. There aren’t any celebrities weeping for DuBose and no one outside of his family and his community is terribly concerned about him. The disparate reactions to animal and human death should not be surprising. Even predatory animals can be imbued with human characteristics by those who find that fascinating. Real human beings who are black are given no such positive benefit of the doubt. In fact, any assumptions made about them are negative while any assumptions of worthiness are reserved for the people who kill them. Challenging Tensing’s right to kill DuBose means challenging the system upon which this nation was built. Not only are millions of people more concerned about a wild animal than a human, but some of those grieving for the lion are actually quite happy when black people are hunted down. Questioning whether the killing was justified would result in a level of cognitive dissonance which would be too difficult to contemplate. Dr. Palmer is now considered to be a villain by millions of people around the world. He didn’t shoot a man in the head, invade another country, torture anyone or give public money to crooked banksters. Any of these acts ought to make him a target of contempt but doing so would require more thought than the average American can muster. He should have found a reason, any reason to kill a black person. Had he done that he would now have no worries at all.